Standing high on Castle Hill (A), near Burley, can be found the remains of an Iron Age hill fort dating back perhaps 2,500 years. Parts have been destroyed by later development, but a clearly visible eroded bank - the remains of a once substantial defensive rampart - and now part-filled external ditch surround a roughly oval area of around 2.4 hectares, recalling habitation by a long-forgotten tribe and ways of life before the Romans came to Britain. Forts of similar vintage can also be found at Buckland - Buckland Rings (B) is on a readily defensible hill-top site and has multiple, parallel ramparts that enclose an area of around 2.8 hectares - and at Ampress (C), both quite close together near Lymington. Meanwhile at Exbury (D), near the mouth of the Beaulieu River, a promontory fort is somewhat precariously positioned only a few metres above sea level. At Malwood (E), near Minstead, an Iron Age fort known as Malwood Castle features the remains of a single rampart and external ditch that enclosed an area of around 1.6 hectares, whilst close by, to the south-west, the remains of a further bank and ditch are assumed to be part of an additional defensive system. At Tatchbury (F), not far from Calmore, are the remains of another multivallate Iron Age fort - a fort with multiple ramparts - that once covered an area of around 2 hectares; and finally, 2 kilometres north-east of Fordingbridge, is Frankenbury (G), a quite large Iron Age hill fort now partially in woodland, on a hill-top overlooking the River Avon. (Confusingly, Frankenbury is also known as Godmanescamp and Godmanescap). (No evidence of prolonged occupation has yet been found, and it has been suggested that these forts may have been used to control the movement of people and goods along the coast and inland waterways). 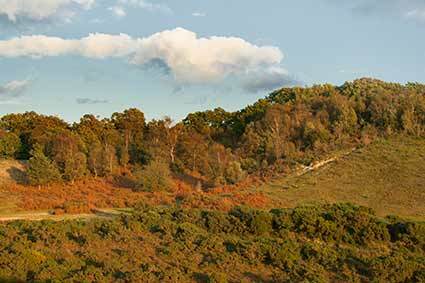 Of the seven New Forest Iron Age hill forts, Buckland Rings and the fort on Castle Hill are most likely to repay a visit with pleasant views, clearly visible, reasonably substantial defensive banks and ditches, and ease of access. (A footpath leads up to Buckland Rings from the A337, a little north of Lymington, whilst Castle Hill is directly accessible from the open Forest).